Should youth baseball and softball players work at a variety of positions or invest time in mastering just one or two? This is a long-standing question and subject of on-going debate. There is a large contingent of folks who believe that, at the ages 6-12 level of baseball and softball, the game should be developmental, which in part means giving kids the chance to play as many positions as possible. …I count myself as part of that group. After nearly a decade of working exclusively with this age of baseball and softball players, I have seen quite a bit and learned a lot about how the game works at the youth level of play. My experiences, observations, and many hours of conversations with parents, coaches, players and league leaders are the basis for my viewpoint on this subject. In this article, I am writing from the perspective of Fall Ball in a Recreational League. I believe these thoughts are also applicable to club/travel ball. However, if a club/travel team has clearly communicated to a family, when their child joined, that they are going to put players at the position(s) the club chooses, we accept their decisions as a condition of joining. Schedule a bunch of games (to ‘just have fun playing’) with no practices. The line of thinking is practice is boring and games are fun, and the more the kids play the better they will get. Include an instructional period before each game. When given a two-hour block to play, the first 30-60 minutes is to dedicated to teaching and the development of skills, followed by 60-90 minutes of game play. CAN A PLAYER LEARN FROM JUST PLAYING GAMES? When I coached at the college level, much of the fall was dedicated to scrimmaging. Game play exposes players to many situations in a short period of time. Players learn from dealing with these situations. When mistakes are made, the coaching staff has the opportunity to teach. It is important to understand, however, that much of that teaching is based on instruction that the players received in a drill/practice setting. Trying to teach an entirely new concept, or explain the mechanics of a skill, to an inexperienced child in a game setting is difficult, if not impossible. The reality is, a player needs multiple repetitions in practice to Learn a position. Throwing them into the heat of a game, at a position they are not familiar with, is not the best way for a kid to Learn. Most likely they are not going to fulfill the position’s defensive responsibilities correctly. As a result, they get flustered and frustrated trying to figure out what to do at an unfamiliar position in a game environment. The most effective feedback we can give in a game are reminders of things that we already taught in a practice setting. A game setting is a difficult environment for teaching new content. Something I see a lot in Fall Ball is kids moving to a different position each inning. A player needs consecutive innings at the same position to get a feel for a that position. Moving kids to different positions every inning during a game is not be the best approach for giving kids exposure to multiple positions. Our kids don’t need to play a zillion positions in one day. We have 5-6+ weeks in the fall to get them experience at different positions. My suggestion is to limit kids to 2-3 positions on a given day (and have them, during the pre-game practice, work at the position(s) they will be playing in the game). I also suggest sticking to the same positions two games in a row. Then in games 3 and 4 put the kids at new positions. One thing to keep in mind is that the perspective of the game is quite different on one side of the field versus the other. As best we can, when moving kids to different positions, we want to keep them on the same side of the field or move them to an adjacent position. When shuffling nine (or more) players around there will be instances where one or two players end up being moved further than what is ideal when switching positions. Also, a couple of kids, each game, will end up playing a position for just one inning. 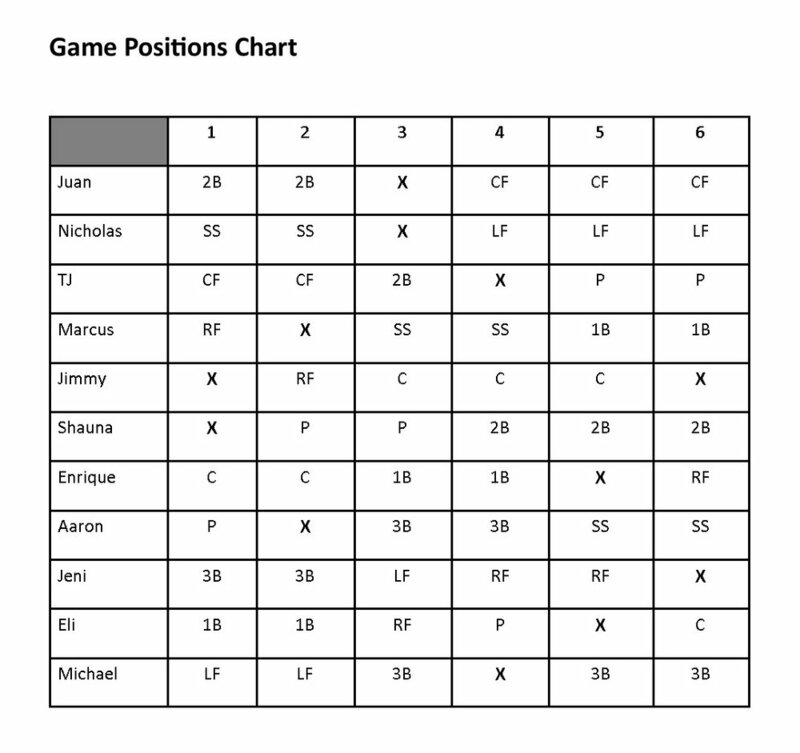 To ensure that we get each player a good number of innings at a variety of positions over the course of the fall we use a ‘Season Positions Log’ of the positions the kids play in each game. Then work off that log as we plan position assignments for each game. The ‘Game Positional Chart’ helps us set up our player moves prior to the start of a game. We post the plan in the dugout when we first arrive at the park, so the kids can see where they will be playing in each inning of the game. Another benefit of this chart is the kids see when they will be sitting out. The chart lets them know when they will be back on the field and that most kids are playing a fairly equal amount of time. Giving kids this information prior to the game lets everyone know where they fit into the plan for the day, and allows them to prepare their minds for where they will be playing. There are a few kids on each team who don’t catch the ball consistently; others don’t have the ability to throw strikes if given the opportunity to pitch, while others are not fast and agile or don’t have much arm strength or the ability to throw accurately across the infield. As we move through our activities it is important not to sacrifice the experience of the group for a single player. 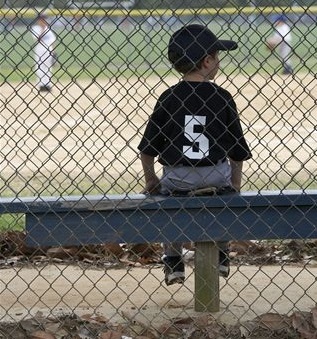 In our well-intentioned effort to give every kid a chance to play each position, we can forget that having a player, who is not equipped with the skills required to play a given position, can negatively impact the experience of rest of the kids in the group (not to mention the umpire, players on the other team and the parents and siblings watching in the stands). We don’t want to take away from the experience of group by having an ill-equipped player at a position that has a negative impact on the flow of a game. We can still let every player play many positions on the field, but not all players can play every position. Let’s not forget that a kid can have a lot of fun, have a great experience and learn the game while playing 5-6 of the nine positions on the field. 1. PITCHER - If we put a kid on the mound who cannot consistently throw strikes, a baseball game quickly becomes ‘17 players watching 1 player practice their pitching’. This is not fair to the pitcher’s teammates, the other team, the umpires or the parents and siblings who are in attendance. Most teams have 3-4 kids who are pretty good pitchers. There will be a couple more who can do an adequate job. Maybe there are 2-3 more who can, with some practice, pitch an inning occasionally. 2. CATCHER - A kid playing this position must be able to consistently catch the ball. This position also requires a player with decent arm strength, some agility and have a good level of focus. Few teams have more than four kids that they can put behind the plate. In most cases only 2-3 kids can play this position a significant number of innings. One unfortunate reality in youth baseball and softball is there is a limited amount of time for giving kids the practice time required to develop the skills of this position. Quite a bit of practice is. needed to become adequate in the skills of this position. When putting a player at catcher who does not have the minimum requirements mentioned we are, in effect, being disrespectful to the others involved in the game. 3. SHORTSTOP - Requires quickness, agility, a strong, accurate throwing arm and a fair amount of instincts for playing the game. Few teams have more than 3-4 kids who can play this position. Putting a player at shortstop who does not possess a minimum level of competency in all these skills can disrupt the quality of, and flow of, a game. 4. FIRST BASE - This is another position where we must put a player who can catch the ball…most every time. This cuts the number of prospects to 4-6. Of these, we are stretching reality for a couple of them. Putting a player at first base who cannot consistently catch the ball is being inconsiderate of the other players on the team. We want to get outs, so we can get back to batting! :) . Taking into consideration the different factors discussed here, when planning position moves, we can create an atmosphere where all the kids learn the game and get to play a lot of different positions. These suggestions can result in a game with a better flow, more at-bats for everyone, more action, more learning and the experience is better for everyone involved.